On a return trip home from Atlanta, we stopped for dinner at a restaurant called American Deli off I-75 in the suburbs south of Atlanta. I went into American Deli expecting sandwiches, but sandwiches were only a small part of the menu. Being that the Superbowl was just about to start as we decided to eat, chicken wings were a very big seller here. They had countless takeout orders of people buying huge quantity of wings to bring home to their parties. This made our wait for food a bit longer than it would probably be otherwise (stupid football game), but it wasn't too bad. I ordered something that I was definitely not expecting to see on American Deli's menu. I had the shrimp fried rice and chicken wing combo. This consisted of a huge mound of fried rice with shrimp, egg, carrots, peas, and onion. Several chicken wings were served alongside with a container of blue cheese for dipping. The rice was tasty, especially since it was from a restaurant that didn't specifically specialize in Chinese food. The shrimp were tiny, but there were enough of them to make up for the small size. I choose medium spiciness on the wings, and it was a good choice. They had a nice kick to them, but didn't leave me begging for water afterwards either. While in Atlanta, I had lunch at a restaurant called Olive Bistro. Thy were located in the corner of a strip mall. They served mostly Greek and Middle Eastern food. There were six of us dining at the restaurant. There were two other occupied tables in the entire place, but our server seemed very flustered and annoyed to have a larger group come to dine. She made a big deal about splitting the checks. Apparently her ability to give separate checks or a single check depended on if the restaurant remained really busy when we were done eating (the two other tables?). When ordering, there were also issues with someone at the table who just wanted to order dessert. Apparently only eating dessert was against the restaurant's policies. This person then tried ordering a side item as well, but this was also unacceptable. Finally, when a hummus appetizer was picked without the side or dessert, it passed and was acceptable. Desserts and side items can't be ordered without an entree at Olive Bistro but appetizers can? While in Atlanta, I had lunch at a restaurant called Eats. Eats had an interesting setup which was also a bit confusing. They had a few counters, each serving a different type of food. Above the counters, they had menus that weren't exactly clear what was available on the day I was there. Once I figured out what was being served, I went with the Jerk Chicken with two sides. The chicken was very flavorful, covered in a slightly spicy jerk seasoning. I chose collards and broccoli casserole as my sides. The collards were good, although nothing exceptional. The broccoli casserole was mostly rice and cheese, with little bits of broccoli mixed in. I was expecting much more broccoli in a broccoli casserole. The meal also was served with a very moist piece of cornbread. Overall, Eats served some pretty tasty eats. The portions were huge and the prices were good. It was 1:00 AM and I was looking for a late dinner in Atlanta. I thought about going to Majestic Diner, but I've done that and was looking for someplace new to try in my food travel adventures. 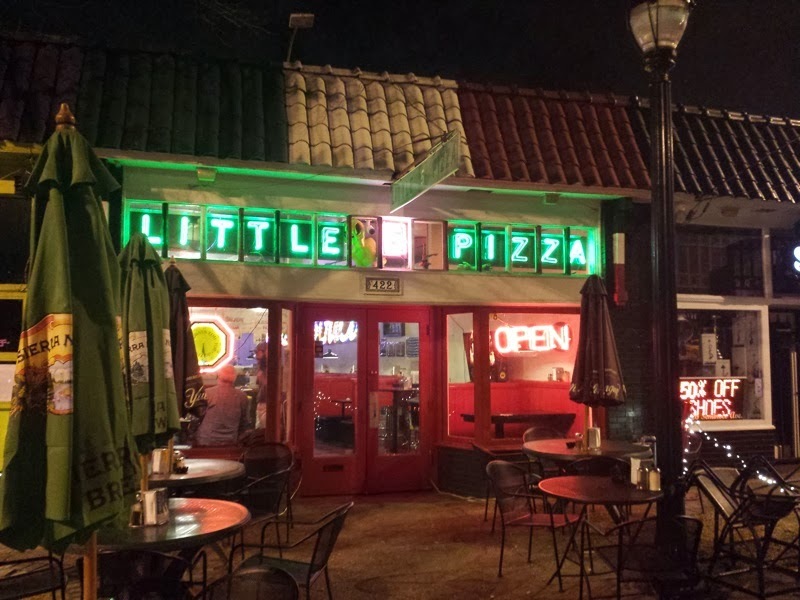 That someplace ended up being a restaurant called Little Five Points Pizza in the neighborhood that shared the same name. I ordered a slice of plain cheese and a slice of their white pizza. Both slices were quite large and I probably would have been full with just one. The cheese slice actually reminded me of Lazy Moon in Orlando. Large, but messy and could have been left in the oven a little longer to have the cheese a little more melted. The white slice was interesting. Most white pizzas don't have tomato sauce, but this one did. 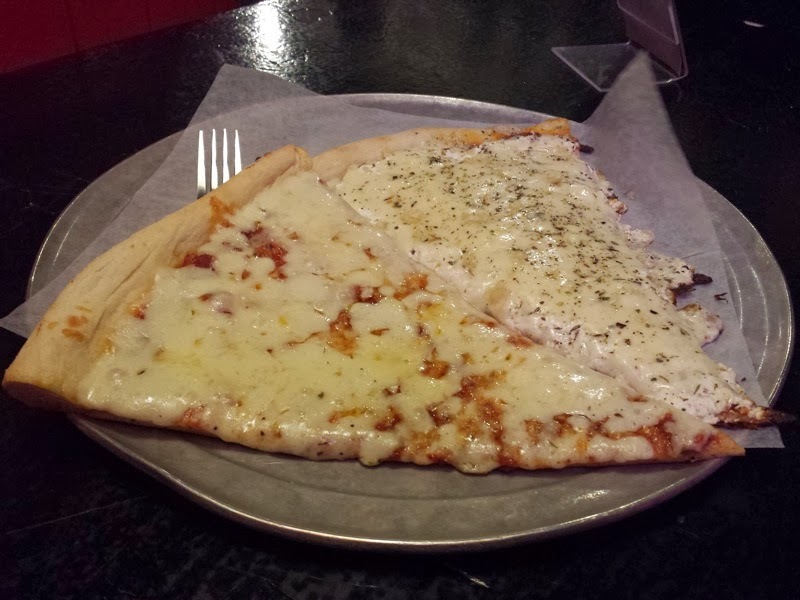 It seemed like a normal slice topped with ricotta, more mozzarella, and an insane amount of garlic. The white slice was my favorite of the two. The pizza here was alright. Nothing wonderful, but it worked for dinner at 1 AM. It seemed like they catered to the people stumbling in from the nearby bars, so perhaps large slices of messy pizza works. This is my third experience with pizza in Atlanta, and I can't say I was really impressed with any of my slices in the city. 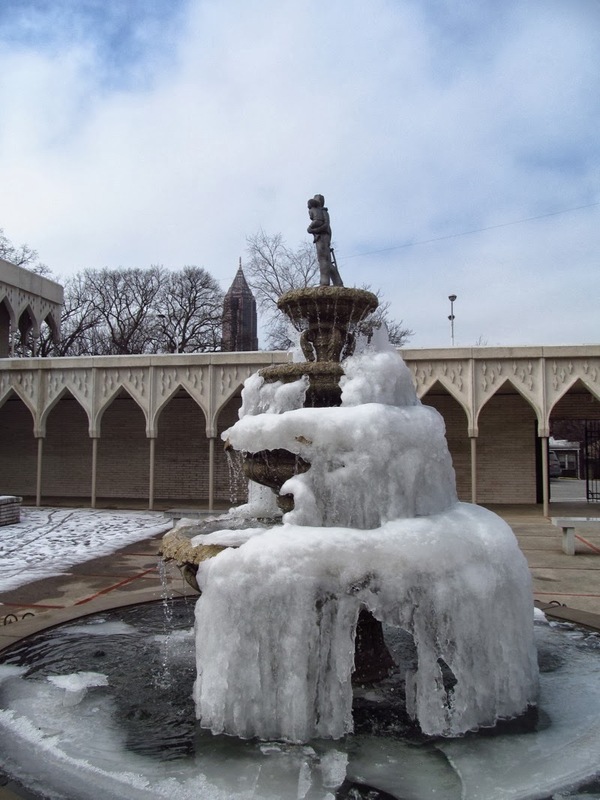 Does Atlanta do good pizza? 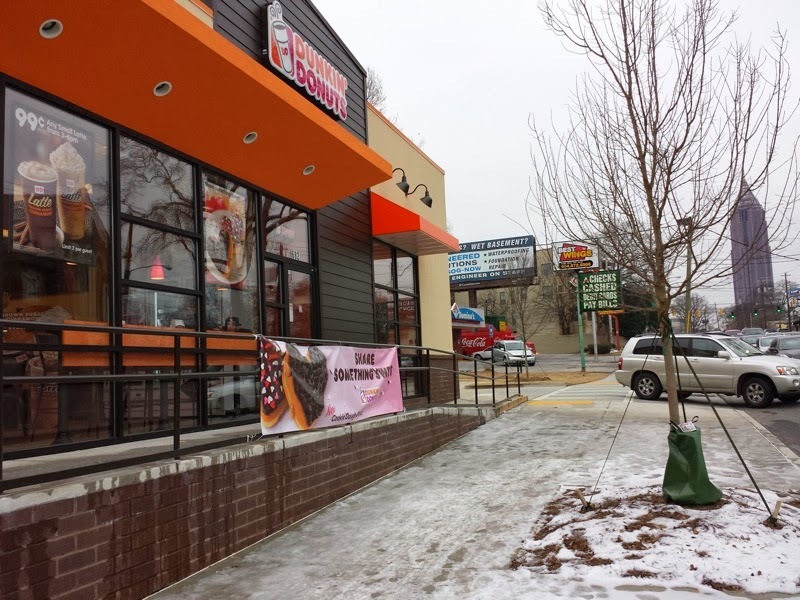 The second reason I decided to write this blog post was because what I ordered at this particular Dunkin Donuts annoyed me. 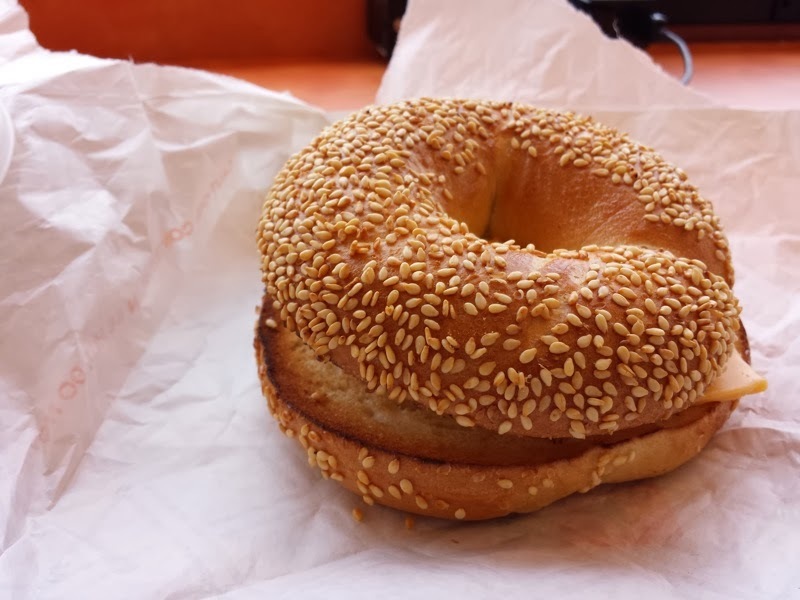 I wanted to get a bacon, egg, and cheese bagel sandwich. I also wanted some hot tea. They had a combo that included the sandwich and a coffee, but I like tea way more than coffee. I asked if I could get the tea instead of coffee with the combo and I was told it couldn't be done. Tea was cheaper than coffee on the menu, but yet buying them separately ended up costing a dollar and change more than the combo which included the more expensive coffee. I had dinner in Atlanta at a Japanese restaurant called Ru San's. This restaurant is apparently a local chain in the area and I ate in the location in Midtown Atlanta. Ru San's was up on the second floor of a strip mall and is apparently under new management according to the banner hanging out front. Inside, Ru San's almost had a nightclub atmosphere with lots of color changing lights and loud music. The prices on much of their menu were very reasonable. I'd return to Ru San's. The food was tasty and was a good value for the price. I was doing some traveling and stopped right off I-75 in Gainesville for gas and lunch. It was decided that we would partake in some barbecue at a restaurant called Bono's Bar-B-Q. We went to their drive through and I ordered the Slawpy Pig Sandwich. 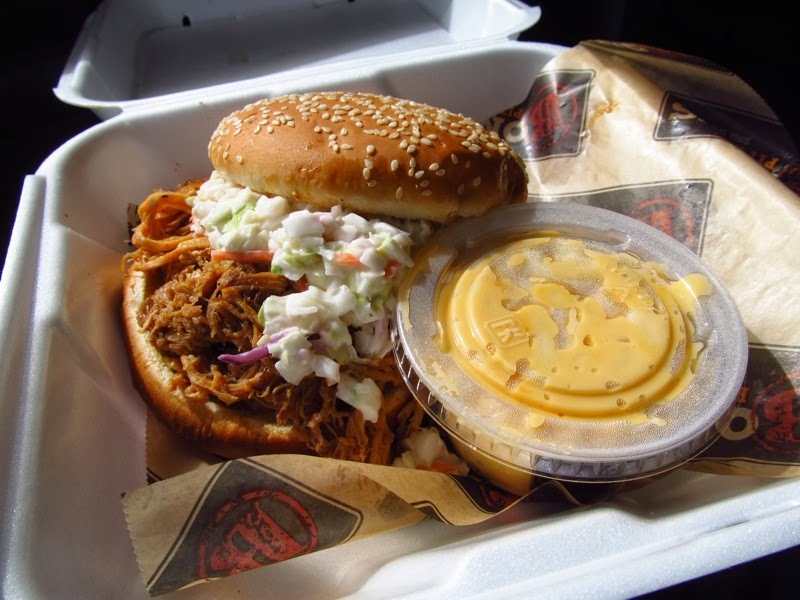 The menu described it as a heaping pile of pulled pork topped with coleslaw. The combination reminded me of the Messy Pig at 4 Rivers back in the Orlando area, which I like. 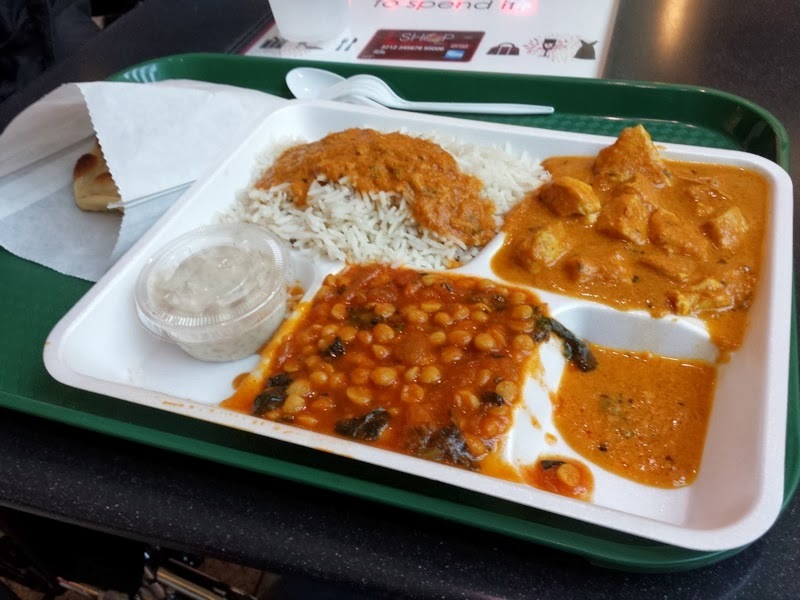 iSpice is a fast food Indian restaurant in the Altamonte Mall Food Court. I've considered eating there at dinner time in the past but I always worried about the turnover on the food. iSpice never seems to have the volume of customers that their neighbors have and I always wondered if the food had been sitting there since the morning. Not saying it works that way, but that thought always stopped me from eating there. I was recently at the mall at lunch time when the food would ideally be fresher and decided to finally give them a try. I ordered the platter which came with a choice of one meat dish, one vegetable dish, rice, naan, and rice pudding. I had the chicken korma for my meat. The chicken was nice and tender and the sauce was very tasty. I had some of the sauce over the rice as well. For the vegetable, I chose the spinach dal, which consisted of lentil and spinach in a very soupy sauce. The naan worked well for soaking up all of the extra sauce. The portion of rice pudding was small but good. Overall, I did enjoy my food at iSpice. It was cheaper than a sit-down Indian restaurant and the platter ended up being plenty of food. 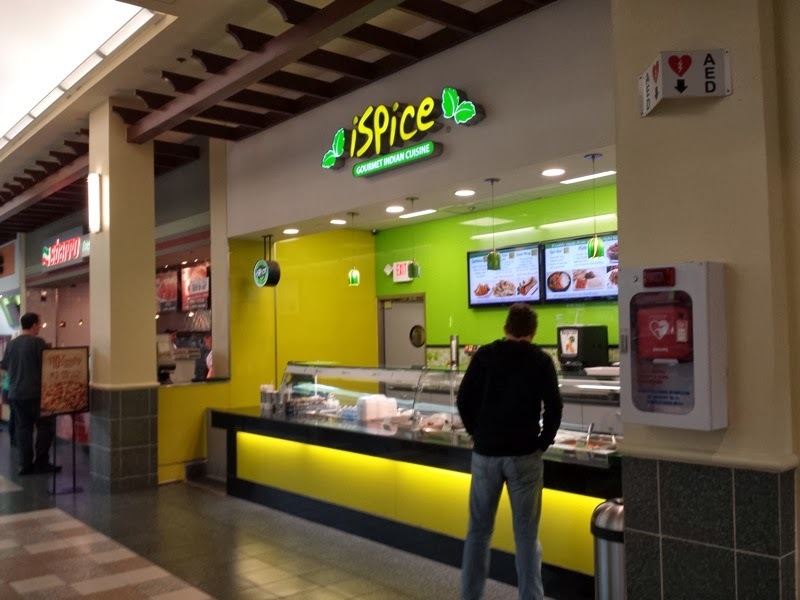 Everything tasted good, and iSpice was definitely a much better choice than some of the other more corporate options in the mall's food court. I'll try them again! 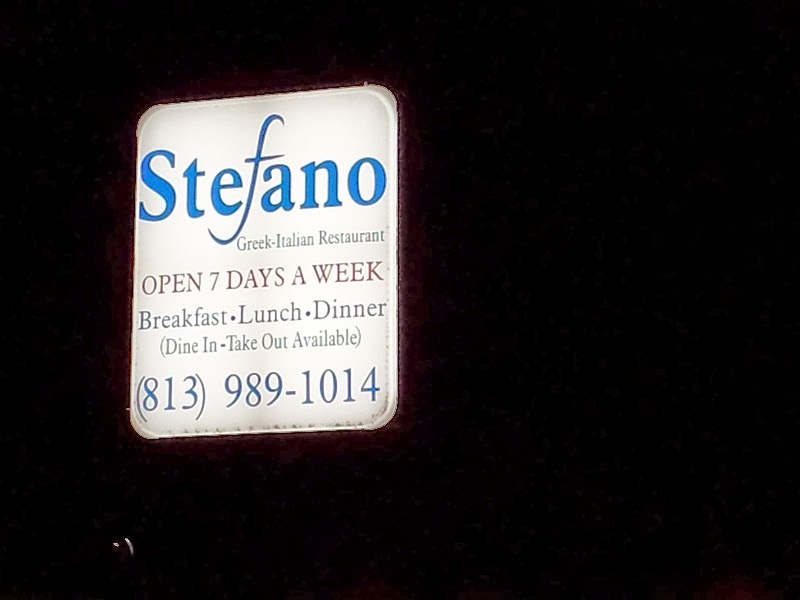 After a long day of looking at animals and riding roller coasters at Busch Gardens, I stopped for dinner nearby at a place called Stefano Greek-Italian Restaurant in Temple Terrace. The menu seemed to be mostly Greek with only a small section of Italian foods. My meal began with a salad and some pita bread. 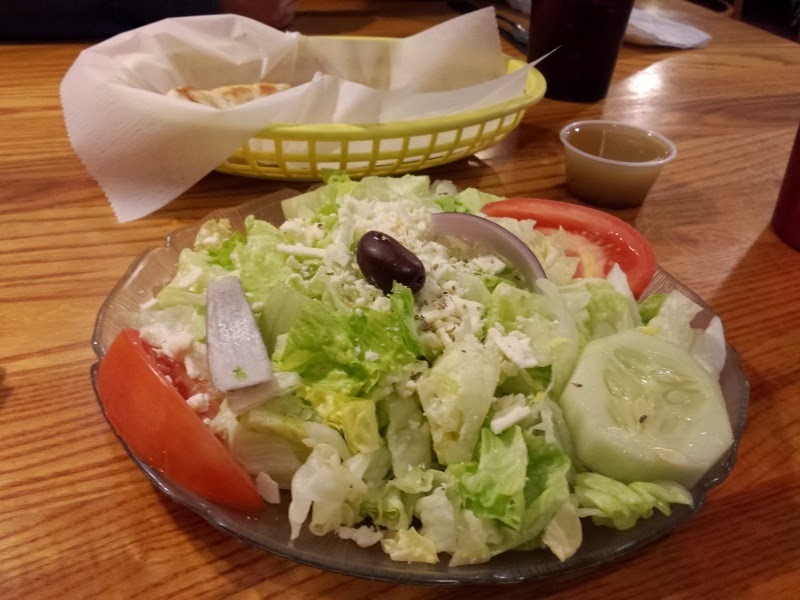 The salad consisted of iceberg lettuce, cucumber, tomato, onion, olives, and feta cheese. It was quite large for a side salad that accompanied my meal. I had the Gyro Plate as my main course. 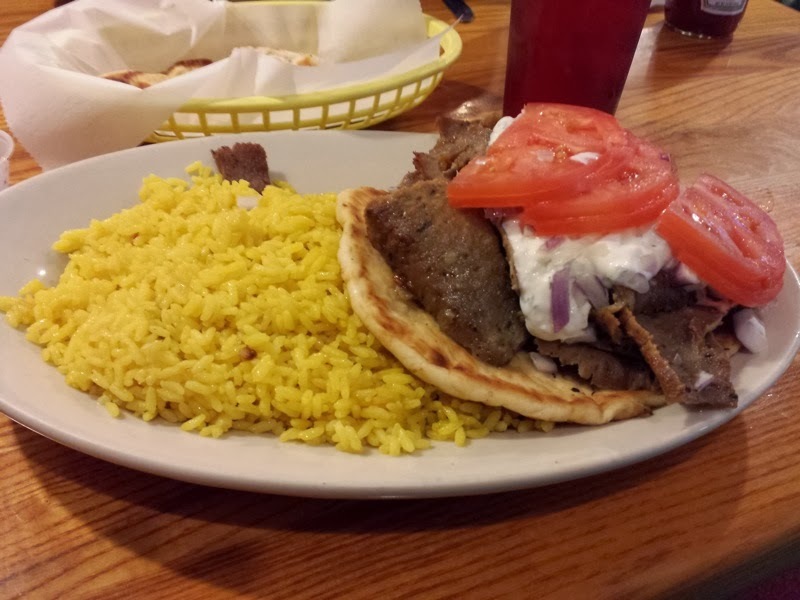 This was an open face gyro sandwich served over a bed of yellow rice. There was lots of thinly sliced gyro meat on a pita, topped with tomato slices, onions, and some of the best tzatziki I can remember having in a long time. The gyro meat itself wasn't as flavorful as what I've had at other Greek restaurants, but the tzatziki made up for the difference. It was yogurt, cucumber, and lots and lots of big pieces of garlic. I probably stunk for the next two days from all the garlic, but I didn't care and finished every drop of the sauce because this tzatziki was delicious. Like the salad, the portion size on the gyro plate was large. It was the first meal I've had in a while where I immediately knew there would be no possible way that I'd finish what was served when the food was brought to the table. I liked the food at Stefano. Prices were reasonable, portions were large, and the food was tasty. I'd go back.